Kason's 100 in. (254 cm) diameter Round Vibratory Screener with KascadeTM Internal Recycle Screening Deck separates oversize particles from bulk material at rates to 150 tons/h. At 100 in. 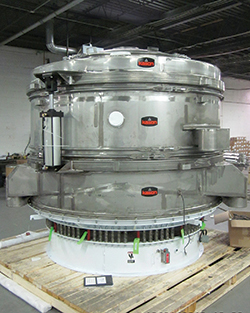 (254 cm) in diameter, Kason's model "K100-2(IRC)-SS" is the world's largest Round Vibratory Screener, according to Henry Alamzad, president. With a screening area in excess of 75 ft2 (7 m2), it can separate oversize particles from bulk material at rates up to 150 tons per hour. Totally enclosed for dust-tight operation, this unit features a high-capacity KascadeTM Internal Recycle Screening Deck design with two screens of the same mesh operating in series, allowing large-scale throughput without sacrificing efficiency or increasing its footprint. Kascade deck is of slightly smaller diameter, allowing for a 360° annular gap at the screen's periphery. As this deck is fed with material at high rates, the on-size material falls straight through the screen of the Kascade deck and is funneled through a hole in the center of the lower conventional screen to the machine's discharge outlet. The overflow material (both on-size and oversize) then cascades over the screen's periphery, and onto the conventional screen deck that scalps the balance of material in normal fashion. lubrication system that pressure-feeds food-grade lubricant to the gyratory motor bearings, extending bearing life by flushing out any dead spots where lubricant might pool, and allowing 6 to 12 months between reservoir replacements. Offered in gravity-fed and in-line pneumatic models for batch or continuous operation, and available to industrial or sanitary standards, the separator is suitable for scalping of bulk food products such as sugar, salt, flour, or starch, as well as non-foods such as plastic pellets/compounds, fertilizer, PTA powder, metal powders, and foundry or "frac" sand.